The other day I got the wonderful news that one of my clients is adding a new baby to their family…a human baby, this time. Cricket*, their first “child,” has grown in to a sensitive four-year old terrier with lots of energy, tons of love to give, and some anxiety in new situations. Sadly, some dogs never adjust to a new baby in the home and desperate parents have no choice but to surrender their pet. Cricket’s mom and dad adore their fur baby and would be absolutely devastated to give him up – even if it was a last resort to protect their human baby – so we want to make sure that he is as prepared as possible for the upcoming change. Ultimately, there is no way to simulate a new baby in the house but exposing Cricket to some of the scents, sounds, and other changes he will experience will help him to adjust to the real thing. Babies are loud and for a dog with a history of sound sensitivity like Cricket, it’s important to get them used to the cries and gurgles that will become a part of daily life. Buy a c.d. (or make a playlist) of baby sounds – crying, cooing, laughing, etc. – and play it (loudly) daily. Give your dog a stuffed Kong to munch on while the c.d. plays so he forms happy associations with the noises. The first several times you play the c.d., do so while you are home with your dog so that if he is frightened, you can reassure him. As he becomes accustomed to it, give your dog a Kong and press play before you leave the house. Sudden noises, such as a baby’s cry in the middle of a quiet night, which can be particularly frightening to a dog. Single out a couple of specific noises that a baby may suddenly make, play them at random times without warning. Gather a handful of treats and when you press play, throw a shower of treats over your dog. This will teach him that a sudden cry means that great things will happen! There are all sorts of new smells that you will bring home with your new baby. Expose your dog to baby powder or other products you will use regularly on your little one in the months before the birth by using it on your own skin and allowing your dog to sniff you. Play games with him while smelling of the baby so that he will form happy associations with these scents. When the baby is born but before he is ready to come home, ask your partner or a friend to take a blanket or piece of clothing that the baby has been wrapped in or worn home to your dog so he can sniff it at length and get used to the new human scent. Your dog will have to get used to the fact that you will holding or otherwise paying attention to the baby a huge percentage of the time. A person holding a baby, or carrying one in a pouch or pack, can look like a distorted monster human to a dog. Buy a life-size babydoll and practice holding and carrying it around at home, as well as simulating other common activities like changing a diaper or bathtime. Show the baby to the dog but treat the doll the way you will your real baby – don’t let your dog lick it or get close enough to jump up on it. Put the babydoll in a stroller and practice walking your dog with the baby stroller, too! If you have friends with babies or young children, invite them over for a visit. Ask your dog to sit calmly with you and your guests and give him a Kong or treats to keep him busy while they are present. The reality of bringing home a new baby is that you simply won’t have as much time to spend with your dog. Even though your natural inclination may be to spend more time with him now to make up for the change, it is actually better for your dog to begin spending less time with him in the months preceding the birth. This will help to mitigate the realization that new baby = less time with mom and dad. It’s very important that your first actual interaction between your dog and your baby is a good one so go slowly. With mom having been in the hospital for a few days, let her greet your dog without the baby – he will be excited to see her! Have someone else take the baby in to the other room while mom calmly gives your dog love and treats. After mom’s initial greeting, sit somewhere comfortable with baby and dog and reward him for being calm. If possible, have a friend or relative introduce your dog to the baby the very first time while you sit with him and give him affection. Also shower him with treats or give him a Kong to make him happy around the baby. 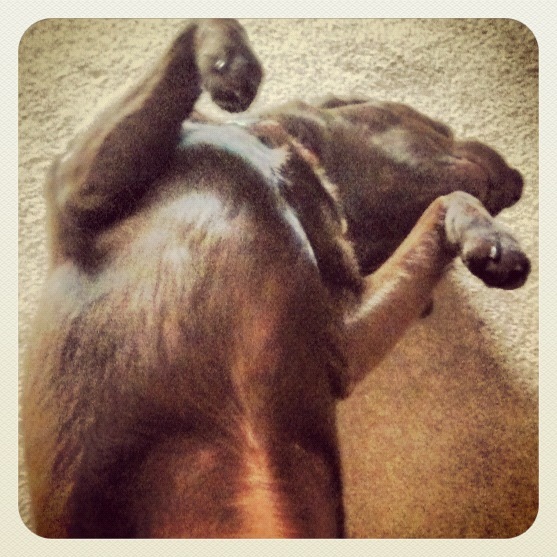 As time passes, be sure to give your dog some one-on-one attention each day. Since dogs are creatures of habit, try to establish a routine that is as similar as possible to the pre-baby one (make changes in your dog’s routine pre-baby to anticipate those that will come when the baby arrives). Above all go slowly and be patient; never force your dog to be around the baby if he is not interested. As things settle down over time, so will he, and you will have one big happy family! 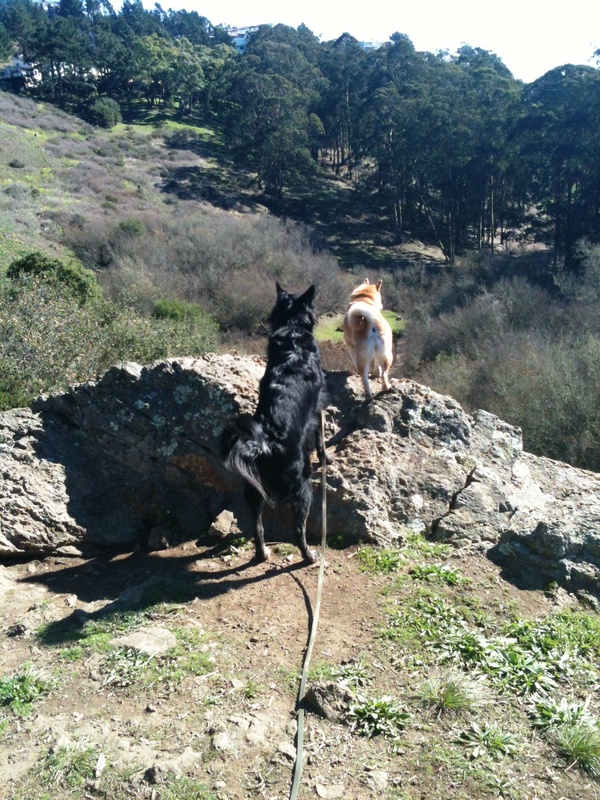 Nevada and Bertie survey Glen Canyon from its rocky cliffs. Some people are surprised to learn that cities like San Francisco are home to lots of wild animals. And it’s not just in the parks, either; one rainy night I awoke to a racoon mama and two babies splashing in a puddle on the rooftop behind my bedroom window. Still, natural, open spaces draw the most life to them. Glen Canyon, where I take a small gorup of dogs every morning, is a major, self-contained ecosystem in the middle of the city. Both predators and prey live in the wooded ravine and on the grassy hillsides. The largest of these, the coyote, is also the most dangerous and last week I was asked, “what would you do if you came upon a coyote?” I had an answer, but it didn’t feel complete, so I thought it was time to do a little research. Do NOT turn your back on a coyote and, especially, don’t start running. This could trigger their prey drive and send them running after you. Do NOT move towards the coyote, especially in a space where he might feel cornered, like against a cliff. Do NOT try to distract the coyote by throwing it food. Make yourself BIG! Extend your arms, stand on your tip toes, fan out your jacket, lift your backpack over your head…use anything at your disposal to appear like a giant, threatening creature. Yell. Loudly. If available, throw sticks and rocks at the coyote while you yell. Slowly move away from the beast…very slowly, one step at a time. Coyotes can be especially dangerous to dogs, though they typically will only attack small breeds, and even this is rare. There was one incident in Golden Gate Park in 2007, however, where (officials speculated) a large breeding pair possibly trying to protect their young attacked a 100lb Rhodesian Ridgeback. Generally coyotes are timid and will usually run the other direction within a few seconds of coming upon you. A greater concern is your dog becoming nervous at the smell or sight of a coyote and taking off in the opposite direction. A terrified dog may hide or run blindly until it is lost, making it difficult to recover. In addition to Golden Gate Park and Glen Canyon, coyotes have been spotted in the Presidio over the last decade. You are most likely to come upon them in the early hours of the morning and at sunset so it may be a good idea to keep your dog on leash while you are in the danger zone.